I find normal weekends hard to fill without spending a huge amount of money, let alone a bank holiday weekend. Finding things to do over three days can be hard but here are some things I do to try and stretch the budget as much as possible. If the weather is nice then find your nearest park / outdoor space with BBQs for people to use. We go to a big forest near us, it makes a change from a normal picnic. Visit a car boot sale. Our local one opens at 6am on a Sunday so when the weather is nice and we are all up early it’s a fun thing to do. Plus the kids always come away with a bag full of things that cost next to nothing which then keep them happy for the rest of the bank holiday weekend! 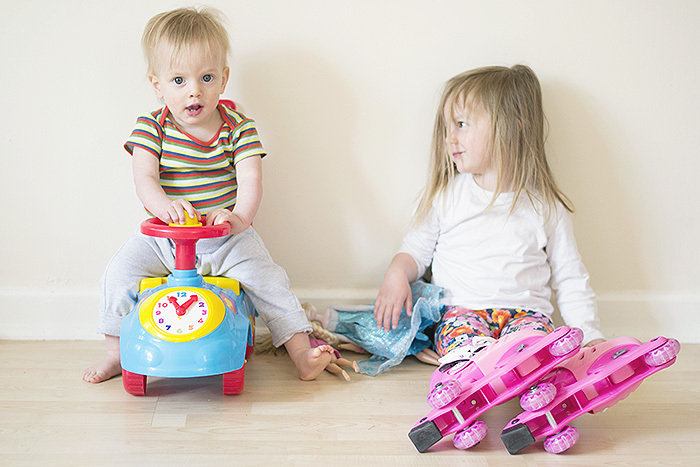 Tiger chose this ride-along toy for £1.50 and Cherry got these rollerskates for £2. We also got a big bag of clothes for £3.50 and some dolls for £1. If it’s raining then check out the movies for juniors viewings at your local cinema. We go to Cineworld and they always have a number of films and they only charge £1.50 a seat which is a real bargain. Even if your kids are a bit young and you don’t stay for the whole film it doesn’t feel like you’ve wasted too much money. Plus as it’s full of other kids you don’t have to worry about disrupting anyone. Cherry stood up and started dancing to Let It Go when I took her to see Frozen a few weeks ago! As Tiger is still a bit young I took Cherry on her own for some one on one time. We haven’t actually tried it yet as Tiger is still a bit young but our local bowling complex also has special offers if you go first thing on a weekend morning. That’s another thing to try on a rainy day. Go out for ice-cream. We have a pub down the road with a really nice garden but the food is expensive and not that great so we don’t really want to waste money going for dinner there. What we do instead is pop there after dinner so the kids can share ice-cream while we have a drink. Still feels like we are going out but as a fraction of the price. Pick a town with good charity shops and go in search of bargains. I absolutely love charity shops, I love never knowing what you are going to find. The skirt in the photo below was only £2.50 and Cherry’s dress is from a car boot sale and cost £2.50. How do get through a bank holiday weekend without spending a fortune?